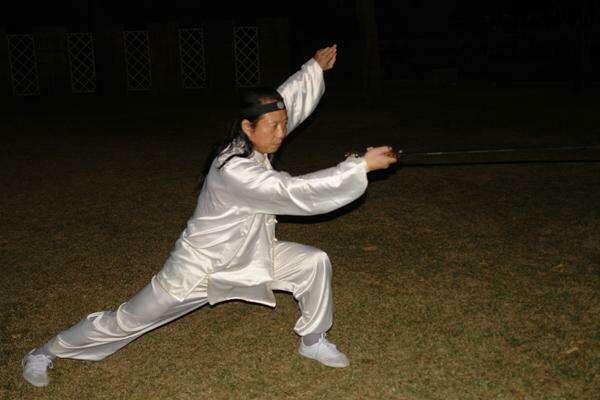 Historical data records that Old Daoist He Xirui is the authentic inheritor of the true and genuine ‘temple’ (院 Yuan) martial arts tradition associated with Wudang Mountain. He is the ‘orthodox’ (正宗 – Zheng Zong) 13th generation inheritor of the ‘Spirit Straight Sword Gate’ (神剑门 - Shen Jian Men) lineage, and the ‘orthodox’ (正宗 – Zheng Zong) 14th generation inheritor of the Wudang Religious Daoist System known as the ‘Hidden Martial School’ (玄武派 – Xuan Wu Pai). This is not surprising, as from his personal profile we learn that he has trained under Li Ruoyu (李若愚) – an esteemed traditional Chinese martial arts teacher, and an expert in Chinese medicine (specialising in healing bone-related injuries), as well as Liu Qirong (刘杞荣) – the former Hunan Wushu team head coach and national stick champion. Old Daoist He Xirui has also received instruction from the famous Wudang Taijiquan and Bagua Zhang expert – Master Lu Zijian (吕紫剑) – who lived until 118 years old. He has also trained with Master Li Guangfu (李光富) – President of the Wudang Religious Daoism Association, Master Huang Wanxiang (黄万祥) – of the Xingyi Quan System, the Shandong Laoshan (崂山) Venerable Old Daoist – Master Kuang Changxiu (匡常修) (also known as ‘Kuang Feitui [匡飞腿] – or ‘Kuang Flying Legs’), and Master Cao Maoen (曹茂恩) - the Shandong Province Wushu Sanda Team Head Coach, as well as many others. Furthermore, he was the 2007- Shenzhen Window of the World - Wushu Sanda Champion. As matters stand, Xu Xiaodong has not officially responded to the ‘challenge’ of Old Daoist He Xirui, but did comment yesterday that he intends to fight three other prominent traditional Chinese martial artists first, namely the bodyguard of actor Ma Yun (马云) – Li Tianjin (李天金), the generational representative of Taijiquan – Master Wang Zhanjun (王战军), and the Shaolin martial arts champion that the Chinese people think is a martial god – namely the ‘Martial Monk First Dragon’ (武僧一龙 – Wu Seng Yi Long).